1. 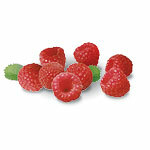 In a bowl stir together Red Raspberry puree, sugar, and lemon juice until well blended. Cover and refrigerate until well chilled. 2. Just before serving, stir in liqueur if desired. Serve this beautiful sauce over chocolate cake, ice creams or sorbets, pound cake, crepes, or frozen yogurt. Layer it for a fruit sundae or try it in a trifle with fresh raspberries and peaches. Substitute 1 packet of sugar substitute for the sugar and omit liqueur.